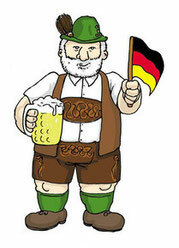 We think that Germany is Germany, but Bavaria is not Germany. Very rich (so it is OK to pay a much higher price for food & souvenirs in touristic sites in Italy and eastern europe). We have only two interesting cities: Berlin and Munich. Where is Cologne ??? We work hard all the time so there is no time for parties. We are always talking about our jobs. We make the best cars and we have got at least one BMW. We even sleep in our cars. We are reliable and solid. We are always wearing "Birkenstock Shoes". Our eating culture is very poor because we only eat Sauerkraut and Bratwurst, all the rest is imported. When we are out of Sauerkraut we eat sausages. We drink a lot of beer and we eat potatoes. Everyone loves soccer, is in a soccer team, or at least a hooligan.